The fifth season of "High Stakes Poker" premiered on GSN last night. 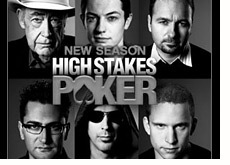 Most people are united in their love of this show, and it was great to see "High Stakes Poker" return to the airwaves. This promises to be a great season of the show, as we will see a great mix of veteran talent (Barry Greenstein, Doyle Brunson, Eli Elezra) and young talent (Tom Dwan, Ilari Sahamies, Peter Eastgate). It should be interesting to see how these two factions interact and play against each other while seated at a high-stakes table on TV. The "young guns" dominated the first episode of season five. Tom Dwan was involved in practically every pot, while Peter Eastgate was involved in two of the biggest hands. The "veteran talent", including Doyle Brunson and Barry Greenstein, were largely silent. They spent their time needling the younger players in an attempt to throw them off their games, especially Tom Dwan. Dwan's table presence was especially impressive - he was certainly the "captain" of the table in the first episode. He was chatty and involved in practically every hand - in short, he dominated the action. Peter Eastgate seemed (to me) to be overwhelmed and nervous by his surroundings. He was clearly playing timidly, as evidenced by his much talked about hand about Tom Dwan (where he just called on the river holding trip 6's). Ilari Sahamies was pretty quiet, but I suspect that we will hear more from him in future episodes. He tried to get involved, but just couldn't get anything going. Doyle Brunson, Eli Elezra and Barry Greenstein were all pretty silent. That being said, from what I've heard, Barry Greenstein gets involved in a few of the biggest pots of the season. David Benyamine won a couple of medium-sized pots. He also looked like death warmed over. Daniel Negreanu won a fairly big pot against Peter Eastgate at the end of the season, and generally played well all episode. I have a sneaking suspicion that Negreanu will end up being one of the biggest winners of the season, as he seemed to be pretty locked in and playing well. Overall, this was a fairly entertaining episode, though I have a feeling that things are really going to pick up in future episodes.